Make your own wedding favors with this oatmeal and goat milk soap project. 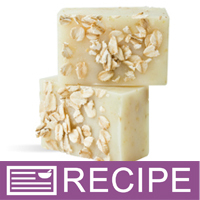 Goat milk soap and oats blend to create a rustic soap wedding favor. As well as looking great on tables, they will add the popular fragrance of oatmeal, milk honey and almond to the room. Package with some rose petals to add a touch of color. You Save $31.67 by purchasing this kit rather than buying the items separately. COMMENTS: I enjoyed making these soaps, although I did not cut them into guest sizes but instead left them whole getting just the 9 bars. The fragrance smells yummy and the oats on top really make the soap. "Why does this recipe call for CP Vanilla Color Stabilizer rather than MP Vanilla Color Stabilizer? Thank you." Staff Answer Thank you for bringing this to our attention. We have updated the recipe to include Vanilla Color Stabilizer for MP soap.